Due to the production method of a sintered base or ptex, you might experience warping and base length/width distorton due to internal tensions. Below you will find information about how sintered base is produced. I have summerized the message in a nutshell. – A base wider then 150mm, is made by welding 2 or more discs and then peeled. This means that the tension from each disc will cause more distortion then in an alpine width base. For SNB base width the max distortion is 8mm/2m. Unfold the ptex before use, lay it flat for min. 48h. In order to speed up the relaxation, you can put it in a heated ‘tunnel’, say in a warm environment such as a heated aluminum plate(s). in order to bring it out of tension a bit faster. Split the ptex and let it relax for 24h. Rough cut the ptex and let it sit for 24h. Fine cut the ptex and let it rest for 24h. So for skis, it is recommended to use alpine width base for minimum distortion. So if you wish to use the snowboard width base for skis, you need to be more careful. Sintering is the processing of a powder plastic of usually higher molecular weight. Especially high-molecular polymers such as UHMW-PE have such high melt viscosity that they cannot be processed by extrusion. The prepared material is homogenized in a blender, filled into a form and compressed in a sintering press using heat and pressure, causing the particles to melt and the grain boundaries fuse into a compact structure. The block materials manufactured this way are mechanically processed in further steps. 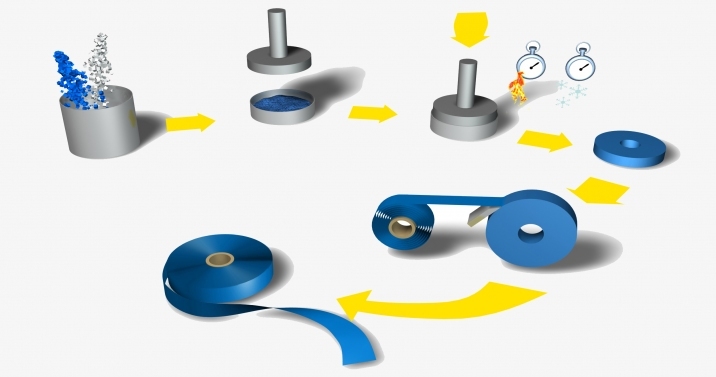 This is how discs with a diameter of about 1000 mm are manufactured from which consequently thin films are “peeled” off. Through the limited height of the forms, discs are welded together before skiving for films with broader widths. You need snowboard width so in that case we weld 3 discs together! Depending on the requirements, materials are pre-treated after skiving with our patented CC process (crystallinity control). Crystallinity of bases is impacted through short heating above the melting point and subsequent quick cooling, thus optimizing transparency and dimensional stability. Due to the fact that the temperature distribution in the disc is not the same in the top/bottom as in the middle(core part) of the disc, the material is getting internal stress. Then we weld different discs with internal stress together. During outgoing inspection we measure the distortion on the snowboard base, which is specified with 8mm.